The main objective of the project is to establish a system for forecasting skills needed on the labour market in Međimurje county, which will contribute to the harmonization of supply and demand on the labour market and provide policy makers with quality and credible information related to the development of Međimurje County. The grant beneficiary is Croatian Employment Service (CES) Regional Office Čakovec, and partners are Regional development agency REDEA, Science and society synergy institute Čakovec, Znanstveno–raziskovalno Središće Bistra Ptuj and L&R social research Wienna. The project lasts from 16/12/2013 to 15/12/2014, and its value is 115.443,61 euros, of which 80,0% is financed from the Progress program, and the remaining 20,0% from CES and partners funds. In line with the project overall objective, first phase of activities related to the implementation of “desk” research was implemented. The survey was conducted to obtain comparative data on educational outcomes, employment and unemployment by level of education and profession, and it will serve to establish a system for forecasting skills needed on the Međimurje County labour market. 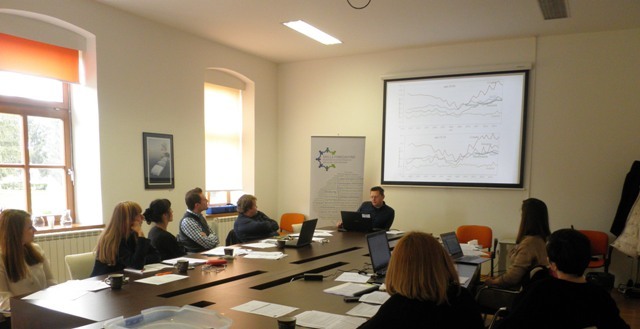 The results of “desk” research and collected quantitative data were presented at the meeting, and the comparison with the Austrian and Slovenian skills forecasting system was made. Thus the collected data have a dual effect: to implement best practices applicable at local level and to serve as a tool for mutual learning. According to the situation, recommendations for the continuation of project activities were given, and conducted research serves as a precondition for establishing a skills forecasting system of Međimurje County. Planned study visits in May and June in Slovenia and Austria will contribute to better understanding of their methods for skills forecasting, inter-institutional cooperation, and the way of collecting data and impact on economic development. In order to exchange as many as possible experiences during the study visits, it is necessary to conduct a survey of employers through a structured questionnaire and to obtain information about the skills needed on labour market. Prepared questionnaire will be adjusted to employers (user friendly) and filled online. Simultaneously with the questionnaires, the campaign on the importance of the mentioned system for economic development of Međimurje County will be carried out.